You can access the Crown Store by pressing the [ , ] key on your keyboard. 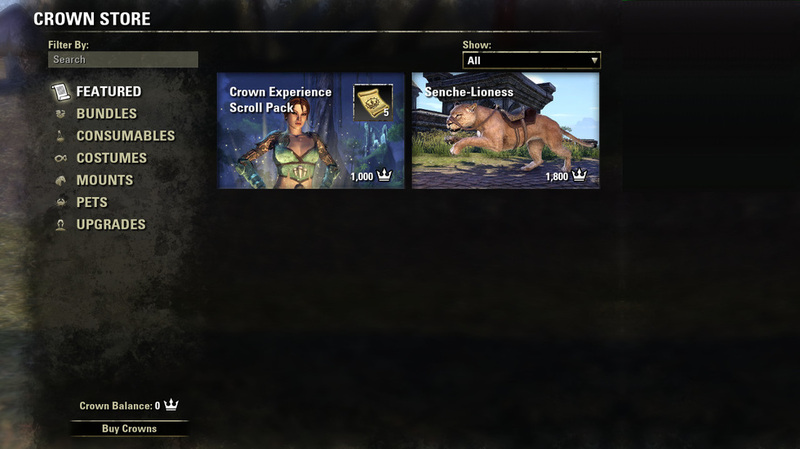 The Crown Store offers extra additions to the game. Like Mounts, Costumes, Consumables, Pets and Upgrades. To play the game, you do NOT have to purchase these. The Consumables page shows crafting motifs, utilities, food, drinks and potions. The Pets page shows you all the available pets in the game. These will follow you through your adventure and are purely cosmetic. The Crown Balance shows how many Crowns (in-game premium currency) you currently own. The Buy Crowns button will open up your standard browser and open up the ESO store. Here you can purchase Crown with real money. - Purchasing Crowns is your own choise and requires real money. We do NOT encourage you to purchase crowns and are not liable for any purchase.